Water is the basic building block for all life on Earth. It covers over two-thirds of the planet, however 97 % is salt while only 3% is naturally potable. The impact of planetary global warming is critical to future human populations as land becomes covered by rising saline seas at an estimated rate of 2.5 meters with each rising degree (Celsius). Finding practical solutions for water purification/desalination is increasingly imperative as humans prepare and adapt for the water-centric environment of the future. Immediate applications for water purification and desalination exist for irrigation, farming, drinking water, but no handheld, direct-from the water source filtration system currently exists, until now. The Nu:a hydrasuit is a smart garment that acts as a second-skin for surfers. 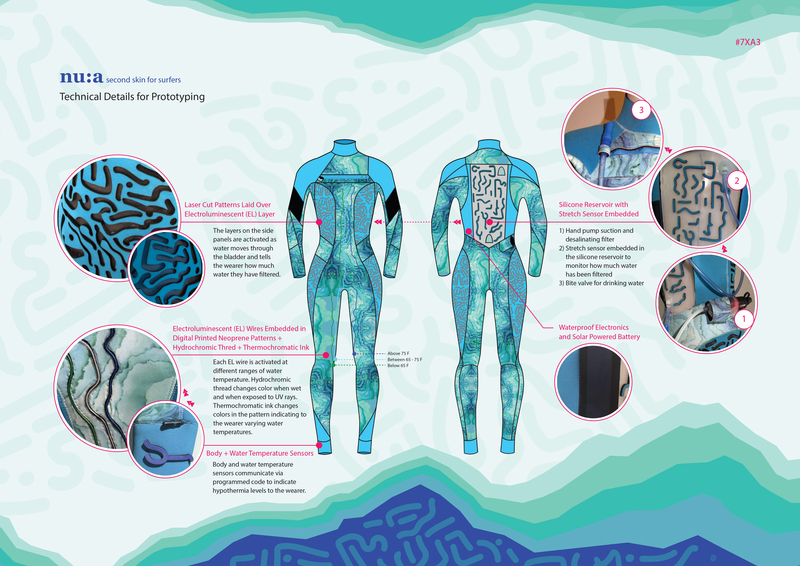 This programmable wetsuit incorporates wearable technology, smart textile innovations and water filtration technology that monitor the relationship between location, body vitals and water. The suit’s on-water filtration system delivers hydration to thirsty boarders while surfing, paddle-boarding and other offshore activities by filtering and purifying sea water, delivering potable drinking water to the wearer directly from the source. This eliminates the need to come ashore for water or wear a hydration pack, which adds weight and impedes balance. Unpotable water is pumped through a submersible, hand-pump fed filter where water is purified/desalinated, and fed through the reservoir, a soft silicone chamber modelled after open-source soft robotic actuators. As water flows up through the system’s components, a stretch sensor monitors the amount of water passing through it and communicates the amount of water the user has consumed. The nu:a hydrasuit features waterproof electronic components including global positioning (GPS) for geolocation, and body temperature, moisture and water temperature sensors programmed to monitor and communicate the wearer’s hypothermic levels. Outputs are displayed by flexible electroluminescent panel displays and embedded LEDs that react in response to changes in the body. Surfers can use our Arduino code and instructions to hack their hydrasuit to collect and share global water temperature data from various regions. The data can be used to raise awareness to the issues of climate change among their social networks and make positive contributions to climate change research through the collection of data. These components are powered by flexible, waterproof solar panels, that feed the suit’s battery and motherboard. Nu:a’s aesthetic design incorporates custom developed and digitally-printed neoprene. The watercolor coastline print represents meter-by-meter change in the coastlines as sea levels rise. Channels for the LED strands were etched into .5 mm neoprene using a beam laser cutter and embedded into the garment. An abstracted brain coral pattern was digitally designed, engineered and laser cut in eco- neoprene and bonded to mesh netting to create an interesting overlay for the electroluminescent panels displays. The brain coral design was also used to create inner chamber pattern inside the reservoir. Nu:a also integrates materials such as thermochromatic, hydrochromic and solar-activated pigments that react to environmental stimuli like heat, moisture and ultraviolet sunlight. Inks applied to the neoprene surface change color and transparency when exposed to water at varying temperatures. Colors change from purple to blue below 77 degrees (F), and from blue to green below 64 degrees (F) and some white to clear when exposed to water. All pattern components were digitized and modelled using 2-D and 3-D technology. 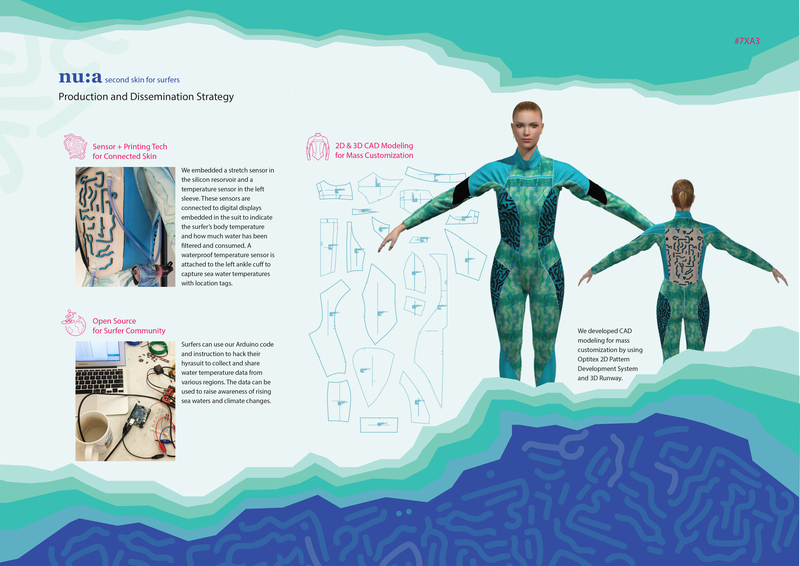 Mass customization features make it possible for consumers to create a bespoke nu:a suit, digitally prototyped and fabricated from anywhere in the world, eliminating the need for wasteful and time consuming garment sample prototyping. Anthropometric measurements are acquired from 3-D body scanning and input, are virtually sampled on a custom avatar, adjusted for fit, and can be patterned and cut digitally. 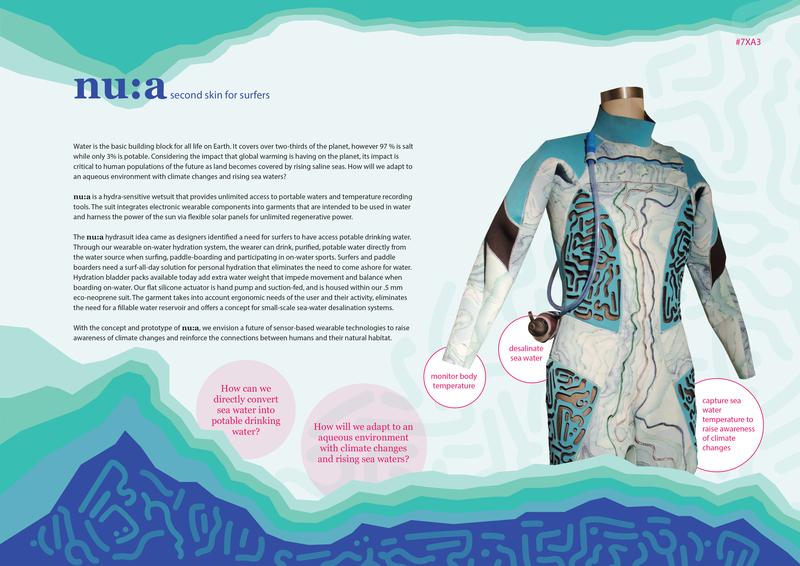 The nu:a hydrasuit concept not only offers unlimited access to potable, purified, desalinated drinking water and hydration and hypothermia monitoring, global location, data contribution, mass customization but also allows us to explore the concepts of biomimicry and environmentalism in tandem with programmable technology. This brings awareness to the issues surrounding climate change, human planetary impact, and helps us envision the future of life on earth as it relates to water.